If you are going to be drinking smoothies on a regular basis, you should take the time and buy a quality smoothie cup or container. Look for durable smoothie cups with lids. A proper smoothie cup will not spill your smoothie and will make it easy to drink your smoothie. We don’t always have the time to chug a smoothie as soon as we make it. It’s nice to be able to take a smoothie in the car or to the gym with you. Transporting a smoothie in a water bottle is not going to work. Smoothies are thicker than other drinks, containers specifically designed for smoothies are a must for someone who drinks smoothies on the go. When traveling somewhere with a smoothie, you want a bottle that will have a large opening for drinking a thick smoothie. You will also want something that is waterproof and will not spill. No one wants to have to clean up a spilled smoothie. If you prefer protein shakes to smoothies, you also have a lot to consider. Attempting to make a protein shake by adding water and protein powdering into a container and then shaking it can lead to mixed results. A lot of the time the protein powder clumps together unevenly. A good protein shaker will be secure and will also assist you in quickly and effectively mixing your shake together. I was lucky enough to test out a bunch of different smoothie cups and protein shakers, and these are the best ones. The Blender Bottle is the classic smoothie cup. It’s specifically designed for milkshakes, smoothies, gainer shakes, etc. This was one of the first smoothie bottles, and it remains one of the most popular to this day. It is currently one of Amazon’s best selling products. This smoothie bottle has a 20-ounce, 28-ounce, or 32-ounce capacity. 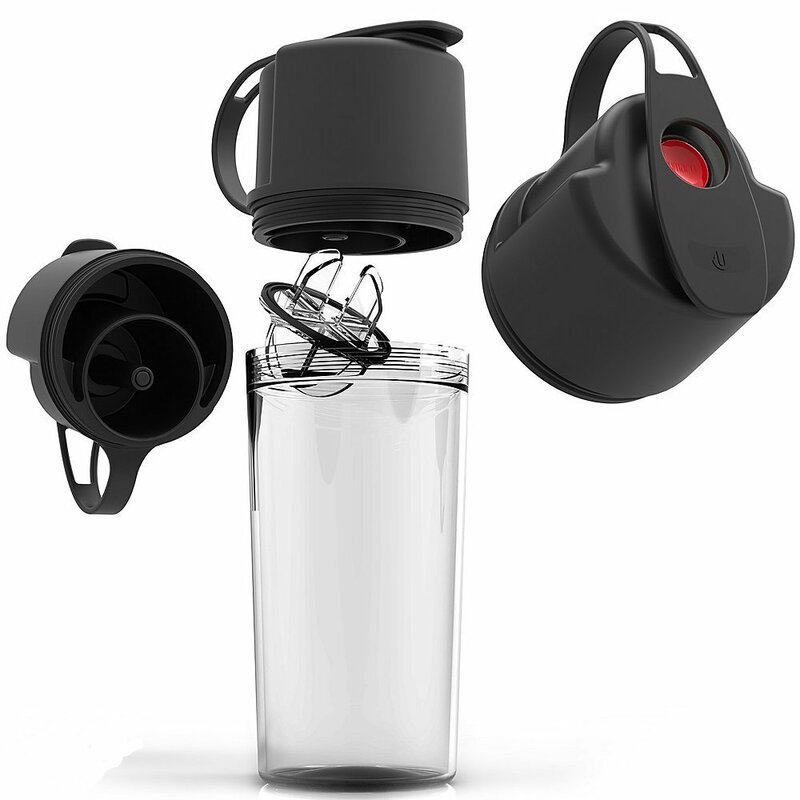 It has a patented loop top, ergonomic flip cap, and tapered spout for easy drinking and filling of the bottle. You won’t spill anything using this bottle. It’s able to handle even the thickest of liquids, with the company even recommending this Blender Bottle for pancake batter. It’s dishwasher safe and made from BPA-free plastic, meaning that it is light weight, safe, and will not shatter. 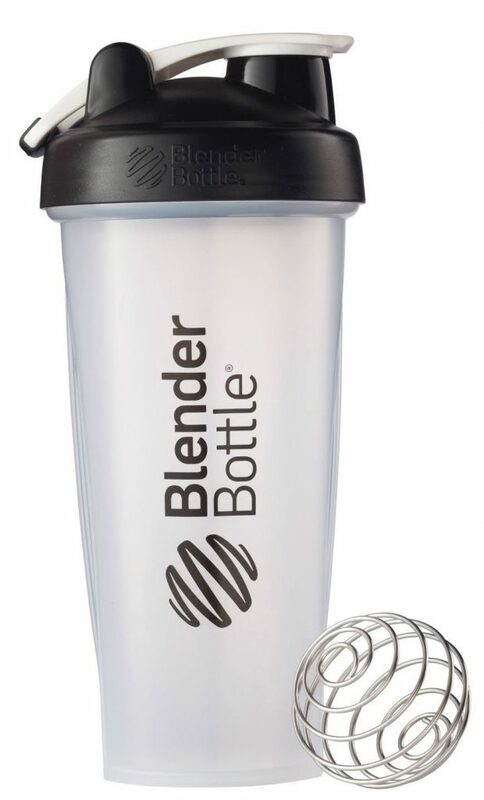 The thing that made Blender Bottle famous is the surgical-grade stainless steel ball that is included. This metal ball lives inside the bottle and stirs your smoothies and shakes up for you. Anyone who has left a thick smoothie to sit for a few hours knows that they can become almost solid in that time. When this happens, you have to re-stir the smoothie. By having a ball inside your bottle you no longer need to carry a spoon or straw with you. There is no need to re-stir the smoothie, just shake up your Blender Bottle and the ball will stir things for you. The ability to stir things up after the shake has been sitting around for a period of time makes this the perfect container for your post-workout drinks. If you like to drink a post-workout shake right after your gym routine, this bottle is perfect. It will re-stir your drink for you, making the drink as good as if it came straight out of a blender. This is my favorite smoothie/shake bottle and what I recommend you get. It’s affordable, versatile and well designed. It works great for both smoothies and shakes. This Umoro shaker bottle has a really creative design. It allows you to use the container for three different purposes; a water bottle, a powder container, and a shaker bottle. How is works is that the bottle has a hidden compartment that you can use to store protein powder in. While the protein powder is stores in the water-proof compartment, you can use the bottle as a regular water bottle. If you are at the gym, you can drink water out of this container like normal. Later, when you are ready to drink a post-workout protein shake, you press a button and the protein powder that you previously had in the hidden compartment is released, mixing into the water. This quickly creates a well mixed protein shake. Your Umoro shaker went from being a simple water bottle to being a shaker cup. This is a great space saving design. Instead of having to carry a water bottle, a container full of protein powder and a shaker cup, you can just carry this Umoro shaker bottle. This shaker stores about 20 ounces of water and about one scoop of protein powder. It’s made from BPA-free plastic. The plastic is very durable and the bottle is covered by a warranty. My biggest problem with this shaker bottle is that it is not designed for smoothies. If you want protein shakes, then this is great. If you want a container for smoothies, go with one of the other options on this list. This PROMiXX mixer is more powerful than just a shake cup. This is actually a battery powered mixer. This mixer is great for mixing a protein powder on the road or re-mixing a smoothie. This is not a blender, and it will not create smoothies from whole foods. There are two great uses for the PROMiXX mixer. The first is making protein shakes on the run. Making a simple protein shake (think protein powder and water) in a blender is overkill. You’re not actually blending anything in this situation. All you are using the blender for is to mix the powder in with the water. The PROMiXX mixer is powerful enough to do this just as well as any blender, but leaves less of a mess. The PROMiXX is battery powered, so you can take it with you wherever you are. Heck, you can even take it camping or hiking and make your protein shakes in the middle of the woods. Anyone who has ever tried to make a protein shake by hand knows that the protein powder does not dissolve very well. You need some kind of electrical mixer to mix up the protein with the water, or else you will be left with clumps of powder. This mixer creates a much better protein drink than attempting to mix protein powder and water by hand does. The other great use for this mixer is re-mixing pre-made smoothies. This is not a blender, so it does not have blades for cutting. But it is powerful enough to remix an already made smoothie. Not everyone everyone wants a plastic shaker container. For those looking for a metal protein shaker this is your best option. This bottle has a double vacuum wall which keeps the contents of the bottle constant no matter what the outside temperature is like. Cold drinks/smoothies will stay cold and warm ones will stay warm. The double wall of this bottle also prevents moisture from accumulating on the outside of the bottle. 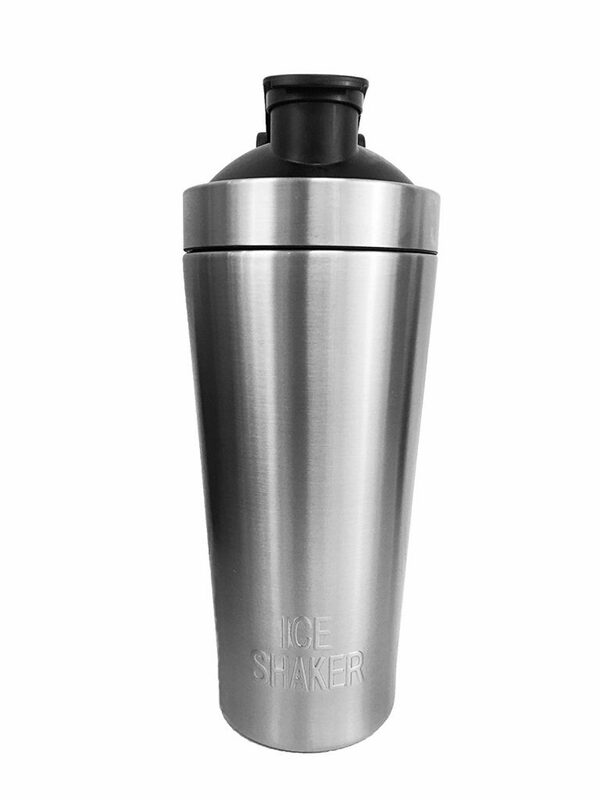 This steel bottle is great for smoothies, shakes, water, coffee, etc. Note that it does not come with a shaker ball for easy mixing. Get this if you want a metal bottle or if you want a bottle that will be useful for drinks other than just shakes and smoothies. If you have the money and already own a Vitamix blender, this is a great quality to-go cup from Vitamix. It has all the high quality you would want from a Vitamix product. This definitely makes your Vitamix more convenient and is specifically designed for smoothies. Mason jars are actually perfectly good smoothie containers. They come with a tight lid, are durable and are big enough to hold a lot of smoothie. You might even have some laying around your kitchen. 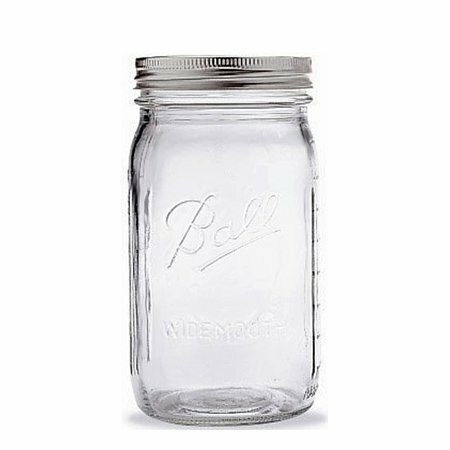 you can get mason jars in many different sizes. There are a few problems with using mason jars as smoothie containers. One is that the glass is a bit heavy and also more fragile than plastic or metal. You don’t want to forgetfully throw your gym bag around only to have your jar shatter and spill glass and smoothie everywhere. They are also not the best to drink out of because their opening is so large. A cup specifically made for drinking smoothies will have a large opening but one that is still small enough that it is not a problem to drink out of. If these two things do not bother you, and you want to save some money, you can use a mason jar as a smoothie cup. I do not recommend the smoothie containers that look like mason jars but have a straw inside of the lid. This makes the lid less secure. 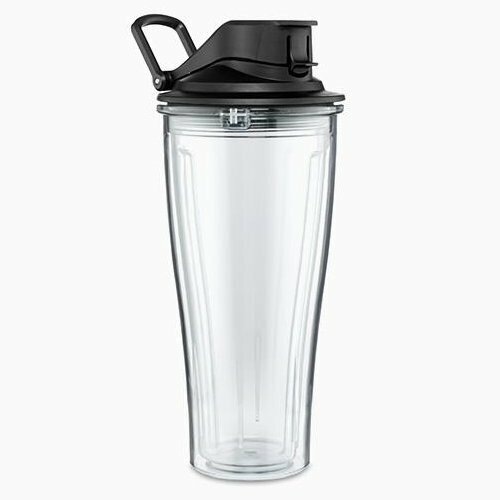 If you are spending the money on a specific smoothie container, I would go with one of the above, specifically the BlenderBottle Classic Loop Top Shaker Bottle. Finally, if you are constantly taking your smoothies to-go, consider getting a Bullet blender. These blenders are specifically designed to allow you to easily take your smoothie or shake to-go.